Do you perform great when you free surf in practice, but tend to fall more in contests? Are you choking in surfing contests? Many surfers have trouble taking their practice performance to the contest because of fear of failure and other mental roadblocks. Do any of these statements relate to you? I feel dejected after contests because I can’t perform up to my potential. I feel like I lose confidence when I can’t get to the finals or semis. I become indecisive and frozen by indecision on the wave. I get easily distracted by people watching me surf during a contest. I perform tight, cautious, or scared of falling or making mistakes in competition. Dr. Patrick Cohn is a master mental training expert at Peak Performance Sports. Dr. Cohn works with athletes and teams worldwide from a variety of sport backgrounds including surfing. As the president and founder of Peak Performance Sports (Orlando, Florida), Dr. Patrick J. Cohn is dedicated to instilling confidence and composure, and teaching effective mental game skills to help surfers perform at maximum levels. In addition to working with surfers, Dr. Cohn teaches parents, coaches, and athletic trainers how to help surfers achieve peak performance through mental game skills. If you are not getting the most out of your performance in competition, it’s time to look at your mental game instead of doing more reps in the water. You can get expert mental coaching with us from anywhere in the world. You can engage in a mental coaching program via Skype, phone, FaceTime, or GoTo Meeting from the comfort of your home or hotel. Today’s video technology allows us to connect with athletes and coaches all over the globe. Consistently take your practice into every contest. Overcome doubts and be proactive with your self-confidence. Use presurf routines to raise the consistency level of your performance. Learn mental strategies to have laser focus and cope with distractions. Manage your emotions after mistakes or miscues. 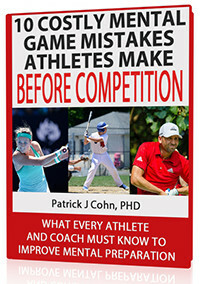 You can improve your mental game with Mental Game Coach, Dr. Patrick Cohn. You can opt for one-on-one sessions with Dr. Cohn in Orlando, Florida, or you can stay where you are and get coaching from anywhere in the world via telephone, Skype, or video-conferencing—also with Dr. Cohn, personally.